This entry was posted in 1989-90 Another Lapse Tour, Soundboard by Doc. Bookmark the permalink. On the night before this gig at 6 oclock I was lay on my bed contemplating my weekend. There was a knock at he door my friend John walked in “Do you want to come to Knebworth?” about 10 hours later John, his sister Sue and I arrived at Knebworth. No tickets. 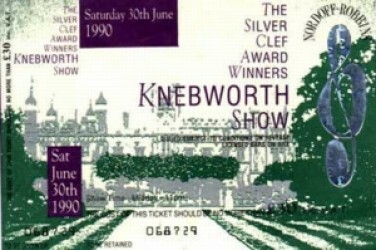 But we were at Knebworth. We lay on the grass had a spliff or two and grabbed some sleep. When I woke up the readio 1 roadshow had sprung up about 100 yards away so I wandered over. Simon Mayo, DJ, was doing a quiz and giving away tickets, there was only about 100-200 people and no one knew the anser to the question “Shine on you crazy diamond is a tribute to who?” I yelled “Syd Barett” and won a ticket, The next question was about Genesis the answer Mama, I won another ticket. I went back to find John and Sue, we bought a third ticket from a tout for £15. Sues son, David, Johns nephew, played little pinky in The Wall.